A patina is a colorization effect formed on copper, bronze, brass or other metal by natural weathering or by artificial treatment with chemicals. The advantage of a chemical patina is it can usually be produced in a short time and with practice, with a predictable appearance. In order to achieve consistent results, however, metal artisans have developed certain methods and approaches to meet this end. Discussed below are basic equipment and procedures which can help lead to a successful patina project. Creating patinas employs concentrated laboratory reagents. Use proper chemicals handling technique and common sense. Protect hands with gloves, eyes with safety splash goggles, and work in a well ventilated area to avoid inhaling any irritating vapors. Wear appropriate protective clothing such as an apron or lab coat/smock. Set up a proper work area. Chemicals can stain your work surface. Keep mixing utensils and measuring containers clean for best results. Chemicals (click to see list), depending on formulas employed. Water. Distilled water gives most consistent results. Containers for mixing and storage. Scale for measurements by weight. Graduated cylinders or beakers for volume measurements. Spoons and scoops for other dry measures. Heat source such as a roofer's torch, propane torch, hair blower, or heat gun. Temperatures for both metal and the preparation are usually within the 180-240° range. Spray bottles and bristle brushes for applying solutions. Safety equipment to protect hands, eyes and lungs. Good ventilation. Heat proof stand to place heated work on. Cleaning and rubbing supplies such as detergent, solvents, Scotch-Brite® pads or steel wool, scouring powder, paper and cotton towels. Sawdust is great for drying and obtaining unusual patterns. Sealant such as a nonporous lacquer, or prepared paste wax by Johnson's, Moser's, or Trewax. A clear-coat acrylic can also be used to stop the patina process. 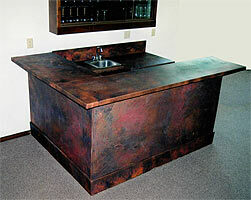 Clean the metal surface - All traces of oils and oxidation should be removed before applying patina chemicals. The most common oils are oils from your hands. Use rubber gloves during washing and subsequent handling. Surfaces can be cleaned by bead-blasting immediately before patina application. A soaking in 10% hydrochloric acid for five to six hours also serves to remove any traces of surface dirt or oil. Other methods include a good detergent wash with a bristle brush and rinsing thoroughly in cool water followed by wiping with a solvent like methyl alcohol. Rubbing with green square pot scrubbers such as Scotch-Brite® or regular steel wool during washing improves the surface for patina by removing oxidation. Also using a fine abrasive along with the steel wool will help the patina to adhere to the surface. Dry with compressed air, clean towels or a hair dryer. Immediately follow with the patina chemicals. Sheet material comes in stock thicknesses. The surface is usually polished to a very consistent finish. Sheet material is great for giving the same consistent result with the same formula. If you need a predictable result, sheet metal might be the way to approach it. Cast material (ingots, sculptures etc.) depends on a few other considerations. Variables like the composition of the metal, uniformity in the cooling process, the mold used and how the piece was cast can all yield a different color on various parts of the casting. Purity of chemicals and water used. Surface preparation including oil and oxidation removal and thoroughness of washing. Hot Process (hot solution, hot metal, hot rinse water). Once a patina color has been created on a metal surface it can be left to continue weathering naturally. Weathering can be arrested at the desired point by applying a suitable oil such as raw linseed oil or lemon oil. Colored finishes can be protected with a nonporous lacquer or a wax coating to improve their resistance to scratching, flaking and tarnishing. Apply wax while the work is still warm to seal the patina. Re-wax when completely cool and buff.